Ghee is the most popular product, it is made from butter with the water content boiled out giving you a flavourful cooking medium that can be used in the same way as regular Butter or cooking oil. Ghee does not require refrigeration as long as no water comes in contact with the Ghee. 24 Mantra Organic Ghee is made from 100% organic butter (made from non-homogenized whole milk from Grass-Fed cows) No GMO's, No Added Salt, No Preservatives, No Trans Fat 99.8% Pure Butter Concentrate. 24 mantra Ghee has a very long and rich history. It has been used in Indian cooking for thousands of years. Traces of 24 mantra Ghee were found in pottery from 6,500 BC and is considered as best for cooking. 24 mantra Ghee is made of cow pure & fresh milk using the traditional standards, the cows are kept in a stress free environment. They are given fodder & concentrate produce of our own farmlands along with clean water to keep them in healthy state. 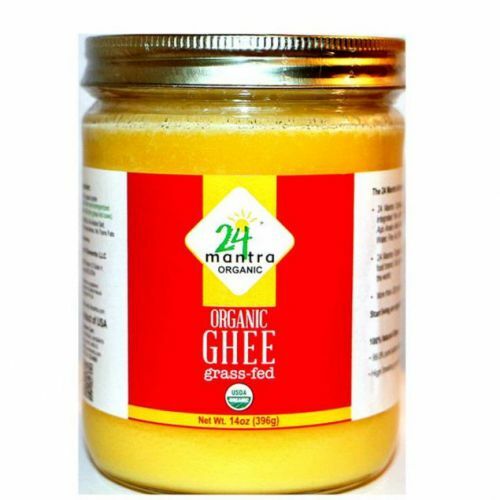 24 mantra Ghee: Is best for cooking Is considered as satvic food Contains healthy fat soluble vitamins which aids in the absorption of nutrients in foods and are essential for good health.